You have buns of steel from bouncing and your baby’s sleep song is weaving its way into your dreams. It might be time to introduce your little one to a lovey – a comforting, familiar object that babies use to soothe themselves to sleep. A far cry from cry-it-out, introducing a lovey can be a simple way to help your baby along the road to a restful night’s sleep. We asked our resident infant sleep expert, Dr. Natalie Barnett, for a few how-tos. According to Dr. Barnett, the best time to introduce a lovey is somewhere between 4 and 6 months. At this age, your baby’s Moro reflex (also known as their startle reflex) has diminished, so there’s no longer a need to swaddle. This means babies’ arms are free to sweep the crib, find their lovey, and do what they need to do to settle. Starting early also gives your baby plenty of time to grow attached. After a few months, it will feel like it’s always been there. The best lovies are not too big and don’t make any noise that could wake or distract your baby – no rattles or scrunchy bits. And while you might consider a big, soft blanket, Dr. Barnett doesn’t recommend them. “Babies can get tangled or find themselves lying on top of their blanket when they want it for comfort. 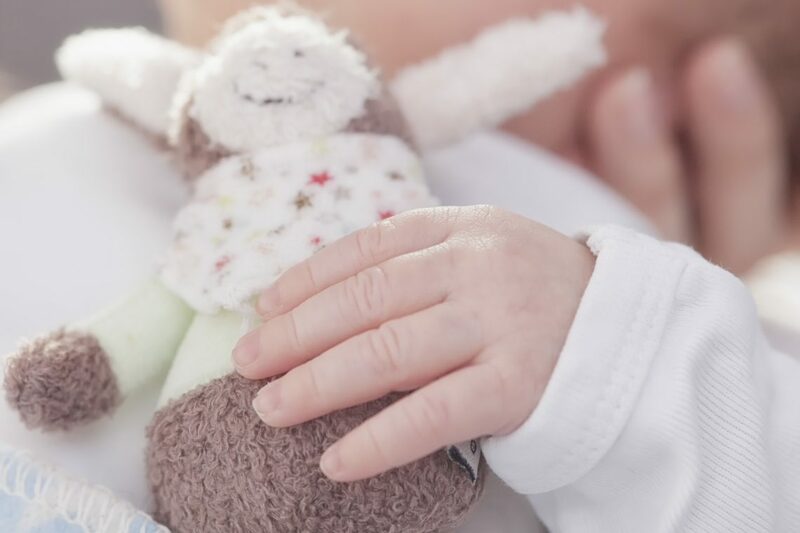 They’re just too large.” Small stuffed toys, or little “blankies” make ideal lovies, although we’ve seen babies get attached to everything from spoons to washcloths. If it’s soothing and safe to keep in the crib, it’s okay. Follow your baby’s cues to choose a lovey they’re more likely to bond with. Do they nuzzle, stroke, or hold hands for comfort? Consider a lovey with materials and texture that will recreate these sensations when you’re not there. Scent is a powerful soother. To create the illusion of a good snuggle, Have mom wear the lovey in her bra (another reason not to choose a large blanket!) or against her skin for an hour or so before you give it to your baby for the first time. “You only have to do this once and it will help your baby become attached” says Dr. Barnett. To make your baby’s lovey a special comfort object and not just another toy, it’s important to reserve the lovey for sleep. You can make the lovey a part of your baby’s nighttime or nap routine if you choose, otherwise it should stay in the crib or wherever your baby sleeps. According to Dr. Barnett, this is the best way to form a strong sleep association. If you’re expecting your baby to fall asleep outside of their crib (in the car, in the stroller, on a plane), you can give it to them then as well. Once the lovey is a constant in your baby’s sleep routine, it can make transitions like travel or learning a new skill a little easier. If you can, have a spare lovey in case of emergency (or eventual disintegration). Swap the two regularly so your baby can’t tell the difference. Since babies are sensitive to changes in texture and smell, there’s less chance of a protest if both lovies have been equally adored. It can also help to wash your baby’s lovey frequently. If they’re used to a lovey that’s on the cleaner side, a regular bath shouldn’t be disruptive. It may take a while for your baby to love their lovey, and that’s okay. “Over the course of a few weeks, they will start to find their lovey and use it in a way that’s unique to them” says Dr. Barnett. It’s important to note some babies will not bond with a lovey at all and that’s okay, too! Your baby will find their own way to relax and fall asleep. Kate Webb is a mother of two small, highly-entertaining humans. And when she can find a hiding spot, Kate is also a freelance writer. Kate is happiest when she can create, persuade, and captivate - whether she's helping others find the right words or doing her kids art projects for them.